Habit: Annual or short-lived perennial herb, not heterostylous. 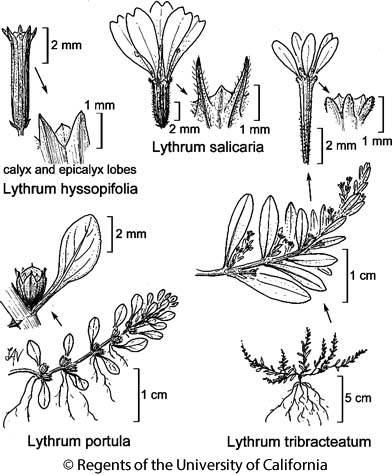 Stem: 1--6 dm; lower branches decumbent to ascending or erect, glabrous, upper few. Leaf: 0.5--3 cm, +- erect, +- glaucous, lower opposite, oblong to elliptic, upper generally alternate, linear. Inflorescence: flowers 1 per axil, sessile. Flower: hypanthium 4--6 mm, cylindric, 4--5 × longer than wide; epicalyx lobes awl-like, +- 2 × > sepals; petals 2--5 mm, pink to rose; stamens 4--6, included; style +- exserted. Fruit: ovoid-oblong, >= hypanthium. Chromosomes: 2n=20. Citation for this treatment: Shirley A. Graham 2012, Lythrum hyssopifolia, in Jepson Flora Project (eds.) Jepson eFlora, http://ucjeps.berkeley.edu/eflora/eflora_display.php?tid=32401, accessed on April 22, 2019.